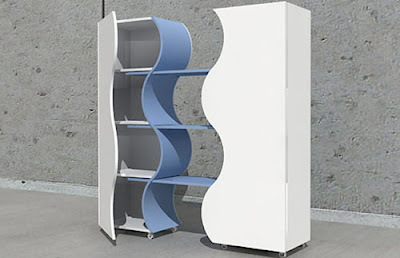 The bookshelf is a cabinet when closed, when it is pulled to sides, the shelves representing the bridges become apparent. Via the selves with rails the TWIN becomes dynamic.TWIN bookshelf represent the two sides of Istanbul, Asian and European, and the bridges connecting them. It compares this connection with the relation of twins. Designed by Zeynep Cinisli.